Ta-dah! 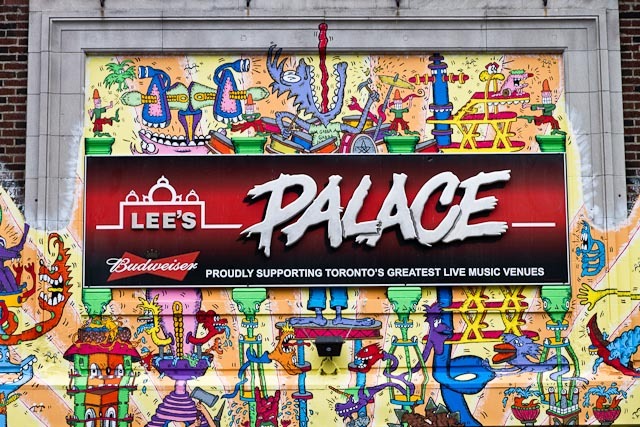 The new Lee’s Palace mural is finally complete. November 24, 2009 will forever be known as the day the monsters died. 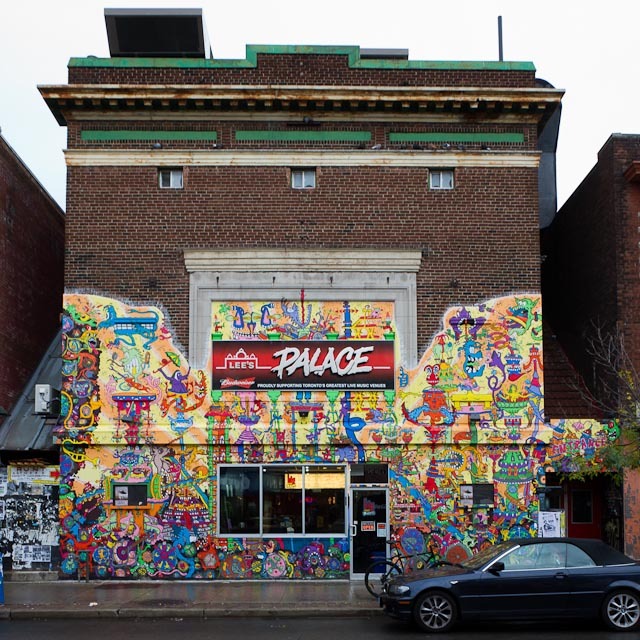 It was then that the iconic illustrations that festooned the front of Lee’s Palace for seventeen years were torn down to make way for a Big Fat Burrito moving in to the storefront. Today, almost ten and a half months later, we’re proud to announce that a new generation has been reborn. And they’re definitely not the Runts of the litter—they’re brighter, denser, and took a really long time. Torontoist reported back in May that Toronto street artist Al Runt, armed with his sketchbook, was ready to create a brand new crew of creepy creatures. Since then, Annex-ers and passersby have witnessed Runt’s progress as his boogie men slowly spread across the two-storey metal façade. Very slowly. Runt originally said he would have the new mural finished by mid-June; by mid-September, after BlogTO mistakenly reported that the piece was finished, it still wasn’t. But besides the free burritos—fodder enough for anyone to make the project stretch as long as possible—Runt wanted to take advantage of the free reign he had, with full artistic license and no deadline from either Big Fat Burrito or Lee’s. “In another seventeen years I’ll be sixty-seven. This is really most likely the last time I’ll paint for [Lee’s],” Runt says, adding that he wanted to take his time to make a more intricate, well thought-out, and sober piece. Lee’s Palace also sprung for a newer, fancier, Budweiser-clad sign (top). Mhm, mhm, those Pac-Men really show the artist’s hunger for his work. Or… he really likes the game (bottom). But complex doesn’t mean deep. Those who try to search for a broader meaning within the monster-ful mess won’t find enlightenment—only a headache. The three-headed Cyclops (seen in the bottom right corner of the photo above) isn’t social commentary, and the green monster-car above it is not a plea for more bike lanes. They’re just homages to some of Runt’s influences, like Ray Harryhausen, Big Daddy Roth, and Famous Monsters of Filmland. His favourite part of his new mural is a three-breasted, four-armed mermaid simply because, well, he likes mermaids. There are also a few references for music junkies to spot, a great way to pass the time waiting for the doors to open before a show (challenge: find the allusions to The Ramones and the Rolling Stones). 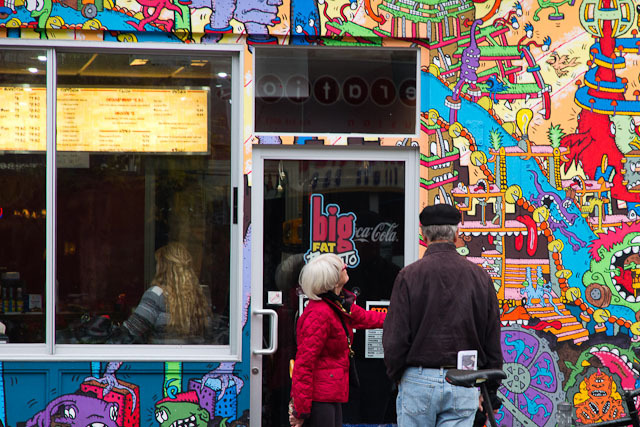 Runt’s the first to admit this mural is “the most challenging to look at,” and says it’ll take a year to know exactly how it fits into the neighbourhood. But it’s already got at least one big fan: the co-owner of Big Fat Burrito, Lisa Shepherd. Or maybe not. With the mural done, Runt’s schedule is open, and he says he’s never gotten a job out of his iconic work at Lee’s. The only other artistic ventures coming up are a show at Jet Fuel Coffee in December, and hopefully one day painting a casino in Dubai (“I figure they have a lot of money.”). “I’m just glad they didn’t get someone else to do it,” he shrugs.